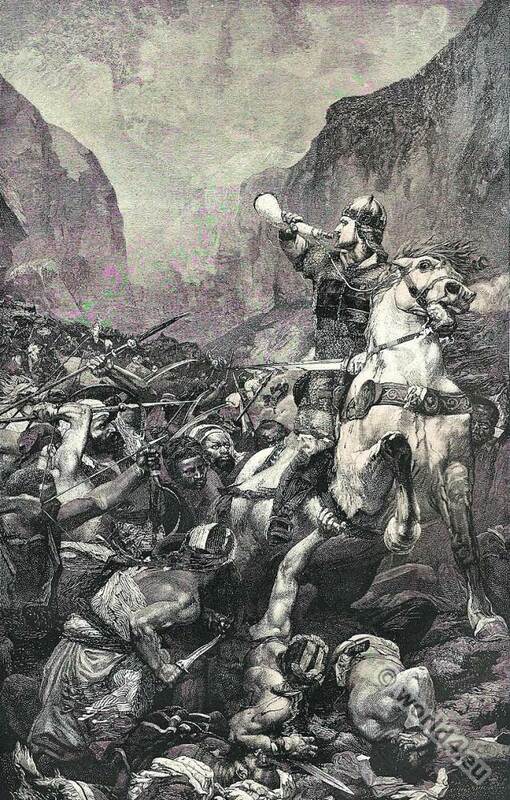 Roland at the Battle of Roncesvalles. Home » Roland at the Battle of Roncesvalles. ROLAND, the hero of Pulci’s “Morgante Maggiore,” was the nephew of Charlemagne. As he was leading the rear-guard of Charlemagne’s army through the valley of Roncesvalles, he was attached by the enemy, set all by the traitor Gan. Dreadful was the slaughter of his knights. “But Roland no sooner saw Uliviero dead than he felt as if he were left alone all the earth, and he teas quite willing to leave it; only be wished that Charlemagne should hear how the case stood before he went, and so he took up the horn and blew it with such force that, at the third blast, it burst in two. Luigi Pulci 1432 -1484 was an Italian poet, who was encouraged by Lorenzo de ‘Medici. He is mainly known through his romantic epic Il Morgante Maggiore wherein a mockery of Christian dogmas of faith and Christian Crusade ideology is expressed. Based on material from France, the poet tells the story of Roland and Renaud of Montauban (in Italian, Renaldo and Rinaldo), the most famous of Charlemagne’s paladins, in a burlesque manner. The first issue appeared 1483. The battle of Roncesvalles was a raid by the local Basque population on the rear of a Frankish army under Charlemagne on 15 August 778. He found near the Basque village of Roncesvalles (Orreaga basque, french Roncevaux) instead. In the following centuries, Roland became the most popular hero of France. In remembrance of the massacre of people Roncesvalles into a gigantic battle was – this at a time when the Christian knights of the West itself went on the crusade to liberate the Holy Land. Charles expedition against the Muslim rulers of Spain was stylized to a favorite crusade – and Roland naturally a Christian martyr. In the Battle of Hastings in 1066 the Normans were singing a song which celebrates the history of Roland. At the end of the 11th century an epic Chanson de Roland that, the Song of Roland, which is now counted among the masterpieces of epic poetry of the Middle Ages came on in Romansh. This entry was posted in 1483, 15th Century, Carolingian, Genre, Italy, Middle Ages, Military and tagged Character sketches, Knighthood, Medieval costume on 10/15/15 by world4.